If in the UK, get a rifle that'll shoot at about 11.5ftlb with a variety of pellets (because one that'll shoot 'just under' 12ftlb with the pellet you use most often will still send you to prison if the pellet the police happen to test it with pops the chrono 'just over'). Get permission from a landowner. Ask around, dress smartly, knock on doors, don't show up drunk, don't bother asking by post or phoning (you'll just irritate them and lessen the chances they'll be friendly to the folk that actually bother to ask them personally). Accept refusals with good grace and retire politely. Keep going till you get one. Once you have a permission, don't bugger it up by being narky to dog walkers and hikers: one word to the police from an irritated Labrador owner and you are back to yearning fruitlessly over copies of AirGun Weekly (or in jail). Look after the land that you have permission to shoot on: don't knacker the fences; don't leave litter; don't take a pop at that out-building gutter when you're bored and stay well away from any livestock on the land. You are an ambassador for hunting now and there are plenty of ill-informed people who would have the whole thing banned - so don't give them ammunition. Learn how to shoot the gun accurately before attempting to shoot your dinner. Practising on live quarry is an utter no-no. Join an air-rifle club or a Field Target club - but practise. 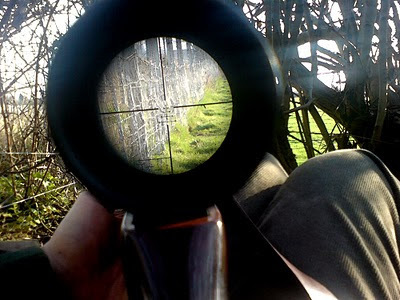 You do not have to be pellet-on-pellet perfect at 75 yards but you will have to practise a good deal before you start hunting unless you are going out specifically to pointlessly maim wildlife (and you shouldn't be). If you can get consistent groups within one inch at thirty yards - from the positions that you'll be using in the field - then you've reached the minimum level to start hunting proper. There's no need to stay at this minimum level however, so do keep practising. You don't really need a full-body, army-sniper ghillie suit; drab clothing, greeny-brown in colour will do nicely. Don't go out hunting in your safety-orange work wear. Don't put highly perfumed fabric conditioner in your washing machine if you're cleaning your hunting gear. You don't need a scope that can shift focus between your outstretched finger and the surface of the moon when your effective shooting range is only up to 40 yards. 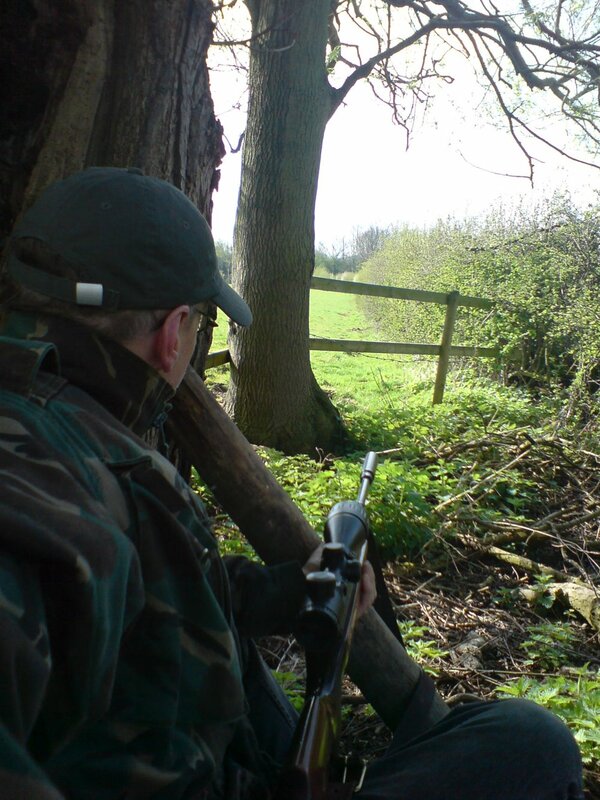 In summer, you can go out mid-afternoon and find rabbits; in the cooler months however, dawn and dusk will be the best times to hunt and, because this is so, a scope that gathers as much light as possible will be helpful - as will an illuminated reticule. This isn't to say that you can't hunt at dusk with an unilluminated 30mm objective lens: you can. But something between 40 and 50mm will allow you to hunt for a good deal longer. If you can afford the light-up reticule, then get one. Consider using see-through mounts for your scope. These aren't that easy to get your hands on but I think they might well mean - for scopes around the 40mm mark - that you could use the iron sights as well as the scope, and this might well give you a little bit more flexibility about the shots you can take and the speed with which you can take them. If you can afford that Airwolf, great, (and while you're here, mister Moneybags, can you see that 'Donate' button to the left?) but you don't need to spend a grand on a gun. If what you want to do is get rabbits for the table and you can afford a pre-charged pneumatic rifle (and the kit that goes with it) and you are not too fussed about getting off more than a hundred shots in an afternoon's shooting (and dear God why would you want to?) - then get one. You will hear people going on about the 'romance of the springer' and 'Oh, it's so much more satisfying shooting with a spring gun' but PCP's are more accurate and will put more rabbits in the pot and that's why you're doing it, not for the joy of the action and the challenge (unless of course you are and in which case, good luck to you). If you can't afford a PCP then buy a decent springer and get good at shooting with what you can afford. A well-made springer, in the hands of someone who has learned how to shoot one, will do the job perfectly. 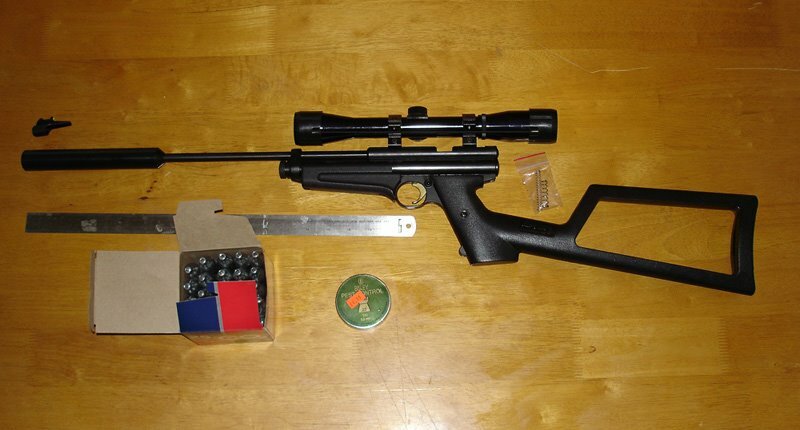 Yes, Crosman 2250 Ratcatchers are cheap and nifty - sadly, they don't do the job. Those Chinese-made CO2 rifles are well made, affordable and can indeed, with a bit of fettling, rival the PCP's for accuracy. CO2, however, is not a free commodity and in cold weather you can get a considerable drop in pressure which will have a knock-on effect on accuracy (and not a good one). Dome headed pellets give the best combination of accuracy and efficiency. Cheap pellets are a false economy since they're inevitably less well made and therefore less predictable in flight. If you buy pellets on-line for economy then try to arrange it so that the Postie does not just pop them through your letterbox: the three-foot drop to the floor will render half the tin unusable. If you can afford the PCP it probably makes sense to get it in .177 calibre. There is more whack in a .22 but all the whack in the world will not put a rabbit in the pot if you miss - and it's trickier judging distance with the steeper parabolic arc of a .22 pellet. Yep, a .20 is probably a good compromise and no, you don't see many of them around second hand. With a springer, I've honestly no idea if there's much difference between .177 and .22 but with a .22 you can reasonably look to take pigeons as well as rabbits because a .22 will drop a pigeon (if you hit it) more effectively than the smaller pellet. Keep the safety on until it's time to shoot. Climbing over fences with a rifle that'll maybe go off if you drop it is a very bad idea: 11.5ftlbs on a pellet into an eye might very well kill you or your mate stone dead. Watch your background. Your pellet will not go half a mile - that's why you don't need a firearms certificate - but it will, if you miss, go straight through that nearby hedge. If you can't absolutely guarantee that there's no one on the other side then you should not be taking that shot. If you hit someone, or their dog, and hurt them, then you'll likely go to jail and you'll deserve it. Walk the land you have permission on; get to know it. Look for burrows; look for paths between burrows; figure out the distances from places you can hide and shoot to likely target areas. If you already know it's thirty yards to that burrow then you can reasonably expect, if you've zeroed at thirty, that you will be putting the pellets in the right place - otherwise you'll be estimating all the time and that takes a while to learn how to do well. Tread softly. Don't wear hob-nailed boots when you're out hunting: rabbits are very sensitive to vibration through the ground so wear light shoes and go easy. Don't cover yourself in eau de cologne before you go out. Rabbits have a very acute sense of smell. Don't chain-smoke while hunting, either - if you do, you won't be. You can camp or you can wander. Camping, settling down a useful distance from a place you expect rabbits to appear, will probably get you some rabbits - but you may need to earn it by sitting or lying silently for a long time - and there's no guarantee that one will appear. Wandering, walking the land in the hope of seeing a rabbit and approaching it by stealth, is much more interesting than camping, but 'interesting' in this context also means 'considerably more challenging'. If you're going to be camping and it's not high summer, dress very warmly: lie motionless on the ground when it's even mildly chilly and you'll soon freeze. 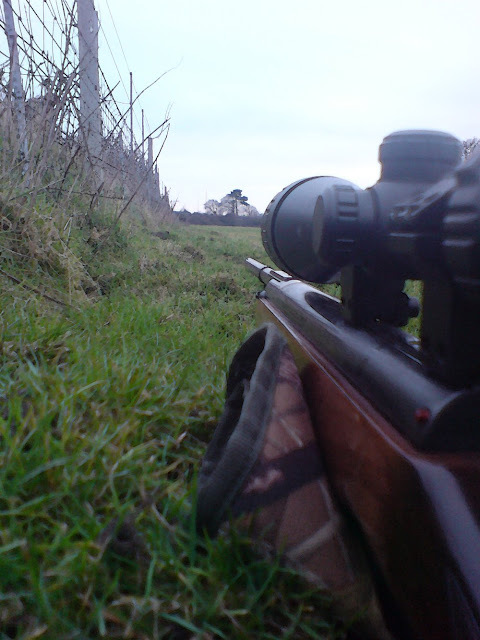 If a rabbit pops out in front of you and sits on the edge of its burrow then you should not shoot at it. 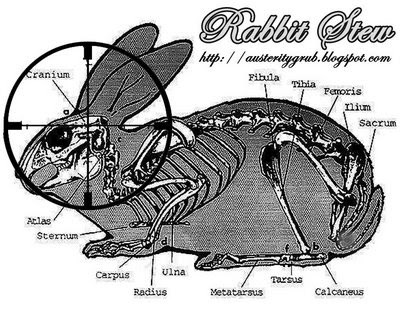 Rabbits need to be so far from their burrow that you can get to a wounded but still mobile rabbit quicker than it can get back to its burrow. This is important. 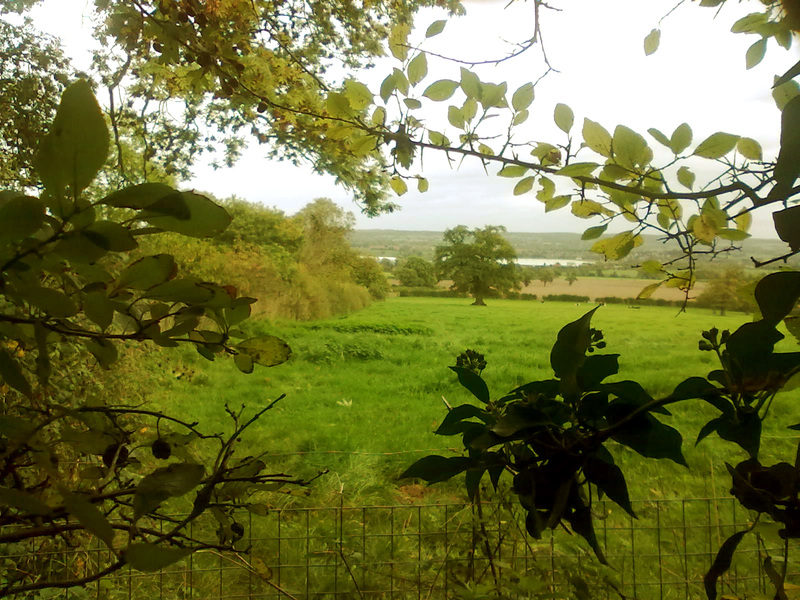 If you can find a spot where you can watch down a burrow-riddled fence line, then that's good. If you can find a spot where you can look down two burrow-riddled fence lines then that's even better. Examine the intersection of fields: is there a little hidey-hole there you can use? If you're wandering, pay attention to the direction of the wind: there's little point walking towards an area that your scent will visit before you get there. Walk into the breeze if you can. Don't camp upwind of a burrow you have hopes for. Rabbits will not sit around while you approach them in plain sight - sad but true. It is possible, using all available cover from hedges, long grass, nettles, overhanging foliage or depressions in the grounds, to creep up on rabbits in daylight - but it is very, very difficult. Hold the rifle across the crooks of your elbows if you are crawling on all fours; advance when they are feeding or looking the other way and freeze if they look up. Don't try this in clothes you're not happy to get filthy because you will get filthy if you do it properly. Wear a hat. Don't be discouraged by numerous failures - it really is very difficult to do this and reading about it on the internet is not the same as learning how to do it. You should be aiming for the point where an imaginary line back from the rabbit's eye intersects with another imaginary line coming down from its ear. That's where its brain is; that's where you want the pellet to go. A dead rabbit will need to be - and this is, unfortunately, the correct term - 'thumbed' to clear the bladder of urine prior to gutting. You hold the rabbit by the front legs with your left hand (if you're right-handed), grab the animal around the stomach and, exerting pressure with your thumb, slide your hand down towards its tail; then you repeat the process till the job is done. Rabbits come with fleas. 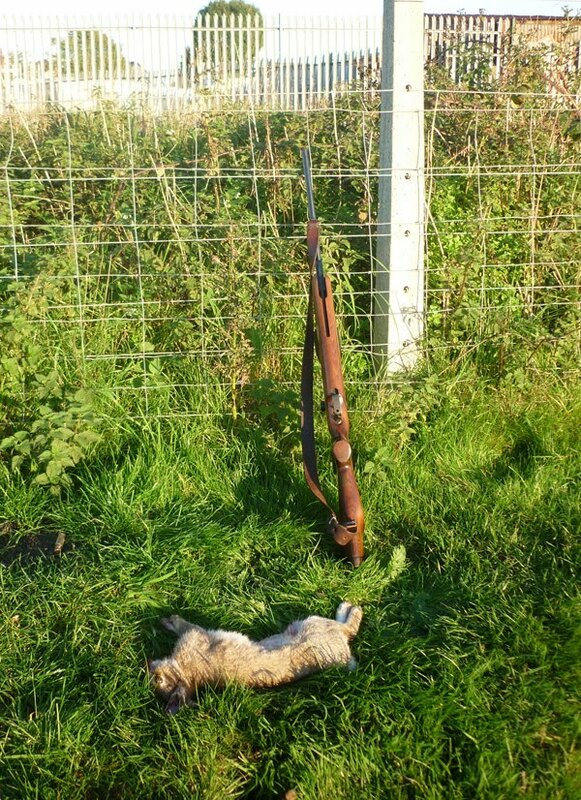 You may decide that hanging your catch on a fencepost for half an hour while they disperse is a good idea; you may equally decide to grit your teeth and get on with gutting the rabbit there and then. It's probably best to gut rabbits in the field. To do so, lay the animal on its back on the ground, pick up the fur just below the bottom of the ribcage and make a nick through the skin beneath. This done, insert the blade of your knife in the nick and, taking care not to slice through any of the revealed intestines (since this will risk tainting the meat), slice the belly open towards the back legs. Pick the rabbit up so that you're holding it with the front legs in your left hand and the back legs in your right and then - holding tightly - make an abrupt gesture away in front of you while turning slightly: the guts - all of them, if you're lucky - will fly out. You may have to tidy up with your knife afterwards. None of this is as pleasant as it sounds. Don't forget to clean your knife when you get home and don't risk cross-contamination by using the same knife for anything else food-related. 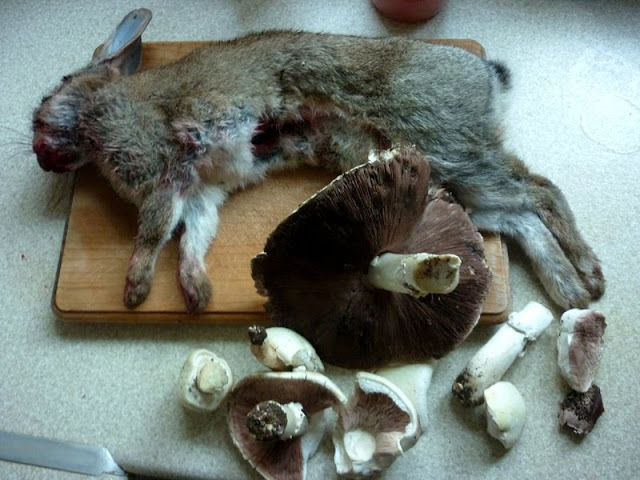 Hey, you've got a rabbit for dinner! Very instructive and helpful post. Makes me want to go out and get a .177 rifle and do some 'wabbit hunting'! Thanks for writing that, one of the most straightforward articles on the subject I've read. Excellent distillation of your experiences. I now wont need to buy anymore airgun magazines (the kind you read). Great read, Huberrt Hubert! It's a totally foreign kind of rabbit hunting to me, but I enjoy seeing the experience through your eyes. Great post with lots of good info for everyone, new or experienced. Thanks for putting it together. Ah Hubert, I miss the wood pidgeons. If I may add something to looking for a place to hunt. DO NOT call at the house with your gun in your hand! Actually I like the spring air rifle, I still have a BSA metior. My favourite was the almost all metal .22 WW2 period BSA. Heavy but I loved it. I mostly hunt with a flintlock fusil these days, but have kept the air rifle. I have enjoyed reading your post. Very thorough post - thank you so much for the tips! I'm a pretty avid deer and turker hunter, haven't been rabbit hunting since I was 15. This certainly makes me want to pick it back up. Also, we'd love to have you contribute over at HuntingBloggers if you'd like! Thanks Sean, and good luck with that Meteor! There's no reason at all to think that, because the gun has a few years on the clock that it's no good for hunting. BSA have always made pretty good guns - though if it has been in a cupboard for twenty years then it might need a little bit of a tickle before you can start learning how to use it. I'm flattered that you say that you now know how to hunt after reading my post, but I'm sorry to say that you're not right about that; you don't know how to hunt yet, I'm afraid, you've just read one post on the internet; learning how to hunt well - legally and humanely - is really not something you can learn how to do while hunched in front of a computer! Maybe pop down to your local air rifle club with that Meteor (in a bag!) and let one of the old hands there look it over for you? I'm sure that they will be glad to. They'll let you know if it's still in good nick or if it needs a tickle from a gunsmith. You could also do a bit of target practise while you're there (and of course, you're going to need to do a lot of target practise before you even think about hunting for live quarry). You might well also pick up some tips at the club about getting permission. Don't forget that bit about land-owner permission, by the way; I'm really not kidding about the severity of the law these days regarding gun-use that's not bang on (excuse the pun!) the letter of the law. But all this aside, yes, great you've got a decent gun; learn how to use it well and responsibly and there's no reason why you shouldn't be able to repay your mother's gift to you with some rabbit for the table in return. I have a borrowed .22 webley vulcan springer but i feel it has to much kickback and rather noisy (no stealth with this gun) plan to buy a PCP Possibly "R-10" but the springer has been good to me, 7 rats 4 skwirls and 3 wood pigeons not bad for two months work in the garden, look out bunnys here i come. Great article mate. Very concise. I was originally looking for an article on how to skin a rabbit in a field, and this was that and more! And to Kenny, my .22 Vulcan is also very noisy but you can buy noise moderators such as the Webley Pro Silencer which attaches on the end of the barrel with a spanner; no threading required! It also increases the length of the barrel which leads to less recoil. Thanks very much, Josh, I'm glad you found it helpful. Happy hunting! A great post, im sure it'l help me alot. Thank you mate, that's very kind of you. what do you do with the corpses if you are just culling them? Sell them to butchers? @Anonymous: you should always use the corpses, it is disrespectfull not to. And thanks for a great article! thanks for the tips as i have a spring gun & son has a gas and we hunt day & night and always go home with rabbits. Mate, if you always go home with rabbits it's you that should be giving me tips!